Like Nigeria itself, which is home to 180 million people, 300 tribes and 500 languages, Lagos is a melting pot of cultural traditions. The city is at the centre of the most important film industry in Africa, Nollywood, which produces around 1,500 films each year. A new institution, Lagos Museum, is being created as part of the redevelopment of the Onikan area of the city as a cultural hub. 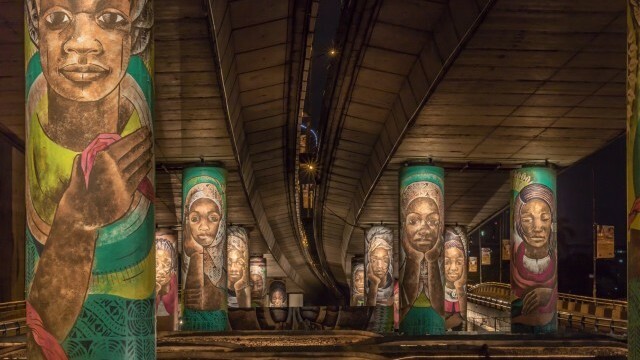 Oluwarantimi by Polly Alakija, public art project commissioned by Lagos State Government. Lagos is a busy port city built on a series of islands and surrounding land on the West Coast of Africa. It one of the fastest growing cities in the world, with a population of 21 million including its surrounding conurbation. Abuja became Nigeria’s capital in 1991, Lagos remains the economic heart of the country. 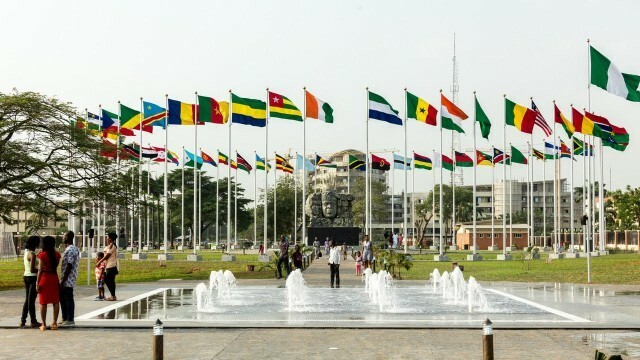 The city is particularly notable for its transformation over the past 20 years, from a place which in the late 90s was beyond state control and regarded as dangerous, to a new world destination with a fledgling tourist industry, which is also attracting back the Nigerian diaspora. Today it is rapidly gaining built infrastructure and regulation, enabling it to attract more investment and continue to develop. Notably, it is building a whole new urban district, Eko Atlantic City, on land reclaimed from the sea, and protected by an 8.5km sea wall. This project reflects the challenges of climate change for Lagos but is also a major statement of confidence in the growing city. Like Nigeria itself, which is home to 180 million people, 300 tribes and 500 languages, Lagos is a melting pot of cultural traditions. The city has a lively growing arts scene, which is as much evident on the streets and in personal celebrations as in formal settings. Owambe parties are common involving large groups of people dancing until dawn, ubiquitous private buses play loud music on the streets and artists gather under bridges showcasing informal galleries of their work. 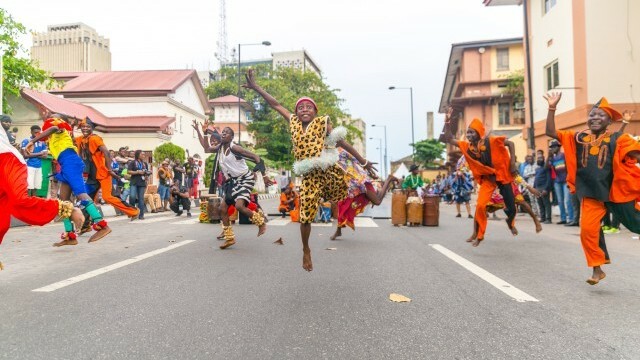 There are also programmed events such as Lagos Street Carnival, with hundreds of performers, and the One Lagos Fiesta which now runs for eight days in several districts of the city at the end of the year, attracting international coverage. Therefore, it is natural that the city is also a place where the creative industries are very significant. Lagos is at the centre of the most important film industry in Africa, Nollywood, which produces around 1,500 films each year, telling stories of ordinary lives which have an appeal across the continent. It is one of the most important homes of the Afrobeats music movement, one aspect of a huge music scene which is beginning to draw tourists from further afield. The city’s formal cultural infrastructure currently consists of 14 theatres, 54 cinema screens, 51 art galleries and 12 museums, 68 bookshops and 20 libraries. 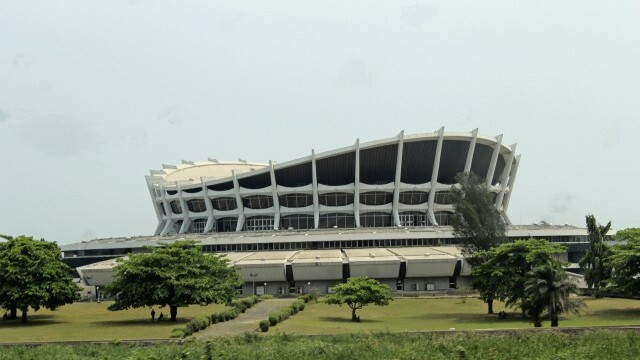 Lagos has also been a significant part of the Nigerian Modernist scene, which it has embraced since the post-colonial era and is evident in its art and architecture, with highlights including the Didi Museum opened in 1983. Provision is still expanding: there are several projects underway to build or renew buildings for culture, including six 500 seat theatres. A new institution, Lagos Museum, is being created as part of the redevelopment of the Onikan area of the city as a cultural hub. The State supports cultural development through its Ministry of Tourism, Arts and Culture and Council for Arts and Culture. These bodies recognise that developing tourism will be crucial not just for Lagos, but for the country as a whole. Lagos held its first tourism summit in 2017 and has begun to publish an annual events calendar so that both tourists and tour operators find it easier to plan visits to the city. City artists and performers deeply feel the social and political issues facing Nigeria, and a new generation have expressed these in films and plays. Overall, however, Lagos is gaining the formal structures it needs for its many burgeoning creative industries to do business in the wider world.